The Folk School of Fairbanks has a new home – at Pioneer Park. The nonprofit school’s board of directors hopes to attract more students and offer more classes on traditional crafts and outdoors skills in the two buildings they’ve moved in to over the past couple of weeks. Board President Gordon Williams and Operations Director Don Kiely showed off the new facilities a couple of weeks ago and talked about the instruction they hope to offer there. The old cabin that’ll house The Folk School’s offices and a classroom or two is a bit rough around the edges. But board President Gordon Williams say it’s the perfect place for the school, which for 15 years has offered hands-on instruction on such traditional skills as woodworking and gardening. Along with some 21st-century sustainability classes on subjects like recycling. 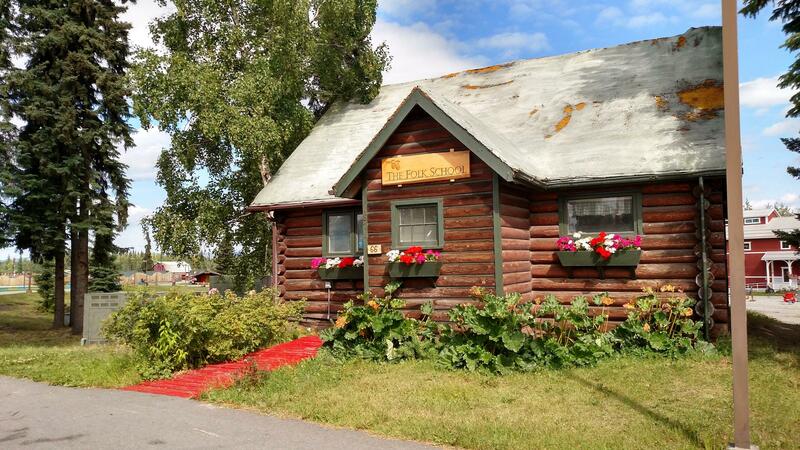 Williams says the cabin next to the Riverboat Nenana and another nearby building both are located much more conveniently than the big cabin on Beverly Lane off Goldstream Road north of Fairbanks that the school’s been operating out of for nearly four years. Williams says accessibility won’t be a problem now. And, consistent with the school’s emphasis on sustainability and conservation, students won’t have to drive a vehicle to get there. Williams says The Folk School should have much greater visibility in Pioneer Park. And he hopes to attract some of the people who go to there with activities it’ll offer at the cabin and the wood shop, located a couple of hundred feet away, near the golden-domed Aviation Museum. He says the school will hold classes in the shop like woodworking open to people of all skill levels. On the walk across the playground to the wood shop, Williams says he hopes the new location also will enable the school to strengthen its relationships with partner organizations, like the Alaska Songbird Institute and Calypso Farm and Ecology Center, that offer expertise and a venue for teaching. Williams opens the door to the building housing the wood shop and flips the light switch. The lights reveals a big shop with power tools and workbenches lined up against a wall, waiting to be set up. And it’s clear that both Williams and Don Kiely, the school’s operations director who tagged along for the tour, are excited about putting all that space to good use. “It’s quite a bit larger than the wood shop that we had at Beverly Lane, as well,” Kiely said. 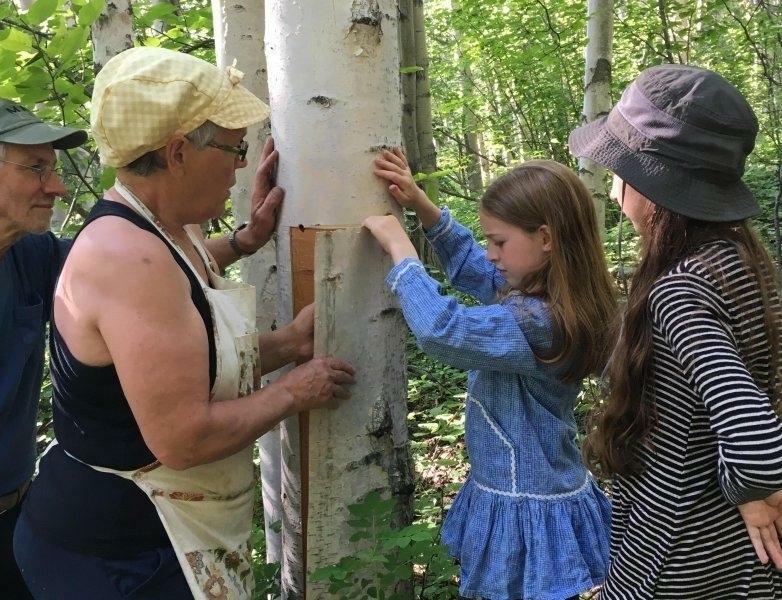 Williams says the bigger shop will be great for teaching students how to build such handiworks as traditional birch-bark canoes and functional furniture like the Sand County Almanac chair, inspired by Aldo Leopold’s seminal work. “There’s something special about when you bring people who are passionate about something they know together with people who are passionate to learn it,” Williams said. Kiely, a longtime Folk School volunteer and supporter, says that passion comes from believing in the school and the instruction that it offers. Folk school staff could use some good karma and some volunteer help in getting their new digs set up before they celebrate their opening with an official ribbon-cutting, with classes beginning soon thereafter. This fall’s lineup includes courses on designing floral bouquets and how to butcher a chicken.